Omar Benlamlih was born in Casablanca in 1980 to a family of musicians and singers within the sufi tradition, originally from Fez. 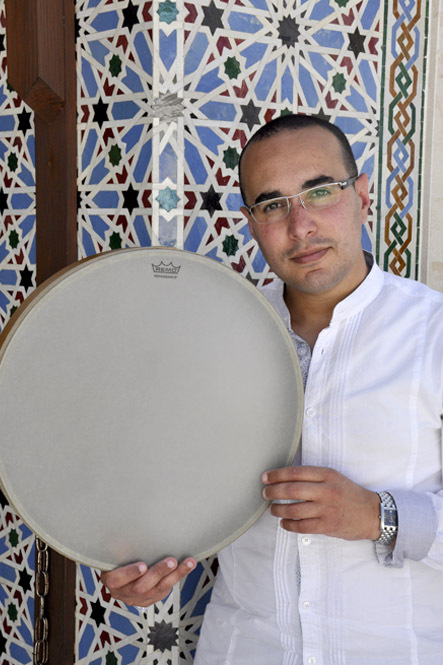 He learnt to sing and play percussion at the Casablanca Academy of Music, and through his attendance at sufi gatherings at various zawiyas in Casablanca and Fez. He is at home singing and playing percussion in a variety of musical genres such as Arabic, Andalusi, Flamenco, Jazz, Celtic and fusion. In 2004, he joined the group, Tangeri Café Orquestra with whom he made his first recording. He has toured Europe with this group taking part in prestigious festivals, such as the European Jazz Expo, in Sardinia, the Festival of Pompei, Lugano Festival and the Festival of Ancient Music in Bari. In 2006, he formed his own group called Turath Al Andalus, dedicated to the interpretation of Arabic, Andalusi and Flamenco fusion. He has been with Al Firdaus Ensemble since its beginning, in 2012, performing with them in concerts and festivals in Europe, North Africa, Turkey, Lebanon, the U.S. and Malaysia. He has recorded on their CDs Safa, released in 2014, and Nur released in 2017, contributing as singer, percussionist, arranger and co-producer.